Wedding photography is the most crucial type of photography. As a professional photographer, you must pay your full attention to this kind of photography. If you can’t handle everything professionally at a wedding party, it will put a negative impact on your career. On the other hand, you will have a brighter career if you can prove your professionalism. And you need to learn wedding photography camera settings with a view to proving your professionalism. RAW Format: RAW is a kind of file format capturing all the data of a particular image when you shoot a photo. It is the best choice to shoot wedding photos. It enables you to get high-quality images when you set up the Raw file format. To clarify, the RAW format helps you correct overexposed images, white balance, and brightness. On the other hand, you will get some poor quality photos if you choose the JPEG format. It is because the information of the image is compressed when you choose the JPEG format. And the information, which is essential for high quality, is lost as well. Wide Aperture: The aperture of a camera is one of the most significant parts that help a photographer to shoot splendid photos. It is actually a hole within the lens of your camera. This segment helps natural light to travel into the main body of the camera. If the value of the aperture is lesser than f/5.0, it is called a wide aperture. And a wide aperture helps the camera focus on the key subject, leaving the background to get blurred. A narrow aperture can never help you in this regard. As a result, a wide aperture is great to capture outstanding wedding photos. Auto White Balance: It does not matter whether you are shooting photos at a wedding or at a public program. Your camera will certainly require you to set up the white balance. It is important for any sort of photography on the planet. You need to set the white balance with a view to balancing the color temperature of a particular image. For this purpose, you can set up your camera both manually and automatically. While you are shooting wedding photos, you should depend on auto white balance. Most of the cameras available on the market come with the auto option. Let’s check out if your camera has the option. Fast Shutter Speed: Shutter Speed plays a vital role to help you shoot splendid photos at a wedding party. You will always get a wedding party as a bustling place. People do not hang out in one place all the time at such a part. You can’t shoot professional photos at a bustling place without setting the perfect shutter speed. In this case, you have to set up a faster shutter speed so that you can shoot photos instantly. Most of the photography veterans say that 1/60th sec is the perfect shutter speed for wedding photography. But there is nothing to worry about your choice. You can change your shutter speed depending on the requirements. Focus and Recompose: Focus and Recompose must be considered seriously while shooting wedding photos. Focus and recompose is choosing the focus of your camera by half-pressing your shutter. While doing this, keep in mind that you have to place your subject at the center. Afterward, recompose according to your taste. If you are satisfied with the recomposition, full-press to release the button of the shutter. Now you are ready to capture some sharp images for your clients. For this purpose, Focus and Recompose are mandatory for wedding photography. High ISO: At the time of the wedding photoshoot, try to use higher ISO. If you are not concerned about ISO, let us know what it is. ISO is the unit of measuring light sensitivity of the film. ISO is generally measured by numbers such as ISO 100, ISO400, ISO 1600, etc. If the ISO is of higher numbers, it means that your film has a high sensitivity with light. On the contrary, a lower numbered ISO is not highly sensitive to light. If you use a higher ISO, it will enable you to shoot higher quality photos in different situations. It is because a higher ISO enables you to use a faster speed of your shutter and a smaller aperture of the lens of your camera. But you should remember that you have to use a reasonable high ISO. Pay Heed to Little Things: Since the wedding party is a bustling place, you will get numerous opportunities to shoot photos. In such a case, you should not get lost to capture only the wow moments. Try to find out some silly but innovative moments to capture a bunch of uncommon photos at the wedding party. To do this, you can keep an assistant photographer with you. Even if you are a solo photographer, you should try to capture some such little moments. Try to Collect a Shot List: Never go to a wedding party without having a shot list. It will put a negative impact on your professionalism. If you miss a significant person to be captured, the wedding couple will be disappointed at you. To escape such situations, you should make sure that you have collected a shot list from the wedding couple. Use a Flash: Many photographers around the world tend to use natural light while capturing photos. If you are one of those photographers, then we have a recommendation for you. Try to take an off-body flash with you. It helps you shoot eye-catching photos at the wedding party. Wear a Pair of Comfortable Shoes: There are some photographers who do not pay any heed to their shoes. You, as a professional photographer, should not neglect this thing. Try to wear a pair of shoes that are highly comfortable for you. In addition, concentrate on the color of your shoes. You should choose the black color in this case. Don’t Forget to Take Snacks and Water: Remember, you have to work all day long while shooting wedding photos. And the pressure of your work will make you forget to take snacks. Even if you are able to remember, you will hardly get enough time to take snacks. In this regard, you should take a pack of snacks and water with you. Take Some Extra Gears: It is always great to keep some backups. If you are in the field of photography for a long time, then you might face a situation when some of your essential gears did not work. What if you face such a situation again in the future? To escape such a situation, you should always keep some extra batteries, lenses, memory cards, and so on. Learn Wedding Photography Camera Settings: If you can do something on your own, you should not depend on others. Camera settings for wedding photography is not a hard task. Just keep in mind what you have learned about camera settings from this post, and use your knowledge to set up your camera for a wedding party. Canon EOS 5D Mark : It is one of the best DSLR cameras that comes up with high-quality images. In the case of price, the camera is not that much costly. You will get the camera at half of the price of Canon EOS 1Dx. In terms of quality, the camera slightly lags behind 1Dx. That is to say, the difference regarding the quality of images between the two cameras is not so big. By the way, it is the best camera for wedding photographers for its compact size, layout, and lower price. In addition, the camera comes up with improved autofocus, clean and boosted ISO and many more outstanding features. Nikon D800: If you are a fan of Nikon cameras, the Nikon D800 is the best choice for you. Even if you have never used a Nikon camera, you can start using this one. The camera is the best in all the criteria a photographer takes into account. To clarify, Nikon D800 is the best for its price, quality, performance, and portability. The color depth of the camera is 25.3 bits, and it has 14 bit of A/D conversion, and a range of 14.4s stops. The images, which are captured by the camera, are highly enlargeable. Considering all these features, you can choose this camera without any hesitation. Sony Alpha A99: The camera is considered as the flagship camera of Sony. It is undoubtedly a pro-level camera. It comes up with 24 MP sensor, which has the highest quality rating of DxOMark image for a full-frame DSLR. The color depth of 25 bits and the dynamic range of 14 stops have made the camera unique in the particular category of the camera. Based on these features, we recommend Sony Alpha A99 for wedding photography. Well, you have the knowledge of wedding photography camera settings in your brain now. In addition, you have come to know some wedding photography tips to shine your career. 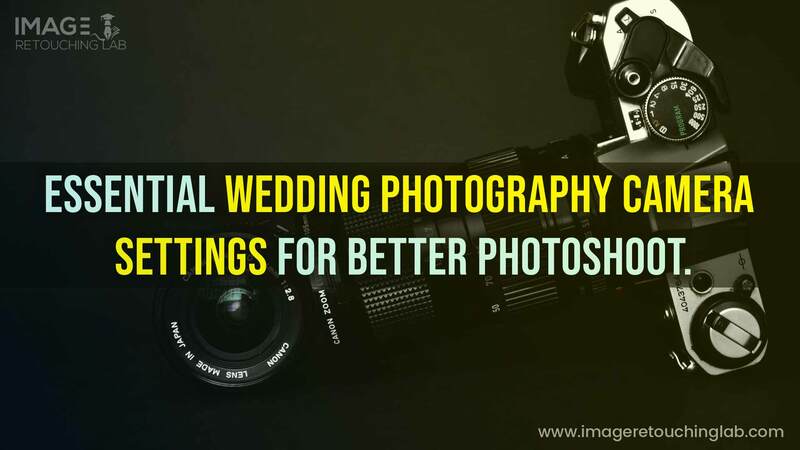 Now, try to apply this knowledge while shooting wedding photos. And don’t forget to get your photos edited by professional editors.